December was unusually warm until......WHAM! Suddenly, the temperature took a dive and it's now properly winter. This was a quick snapshot of the frost on the window pane at Brockenhurst station as I got off the train. Despite the deceptively sunny weather, the temperature was well below 0˚C. 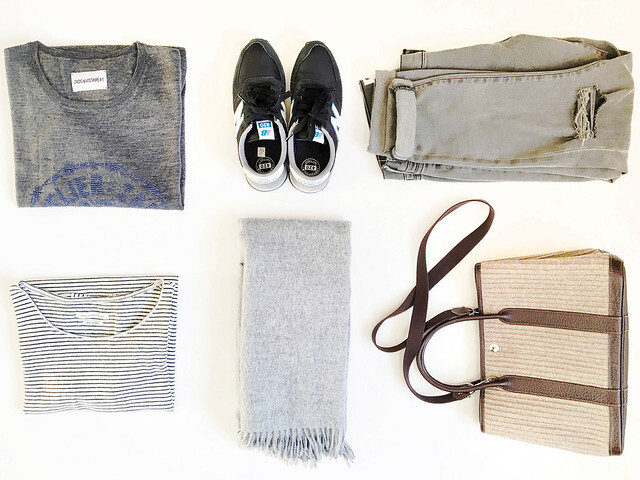 Clockwise: Zadig & Voltaire merino sweater, New Balance 420 sneakers, Frame Denim jeans (65% off), Hermes Garden Party, H&M wool scarf and Isabel Marant Etoile linen t-shirt. Here are some new additions and current favorites. Truthfully, I haven't done a whole lot of shopping other than replacing well worn clothes that'd fallen apart. Either I've been extremely careless and snagged my Uniqlo sweater on sharp edges or a hungry moth had a hell of a feast but my favorite knitwear can no longer be worn out of the house. 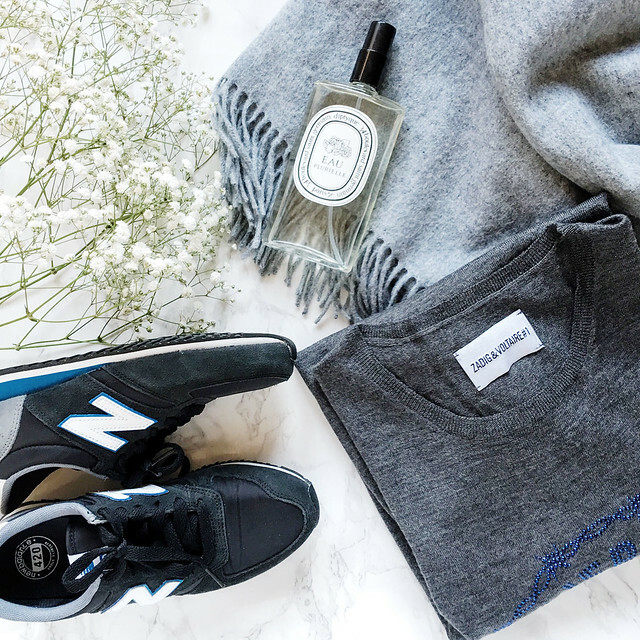 My merino wool sweaters from Zadig & Voltaire have fared incredibly well over the years. No bobbling whatsoever. Incredible. My frugal self managed to nab a brand new Zadig & Voltaire sweater with a cool embellishment for a good price. I couldn't believe my eyes when I saw Isabel Marant Etoile linen tees for 50% off over at The Outnet. This one's from 2 seasons ago and the fabric is a lot thicker than the tees from the last Spring/Summer collection. I caved in and bought the Hermes Garden Party TPM which comes with a detachable strap last year. Very handy and light as a feather. I've had it with heavy bags that ripped my shoulder to shreds. No bag is worth shoulder and back pains. My infamous red New Balance 420s are so well worn that it was high time I shopped for antoher. After seeing Adidas Stan Smith and Superstar sneakers everywhere, I was keen to get a pair........except that the smallest size in the kids' section is still 2 sizes too big. Apparently, they run wide and big. And no....there's no way in hell I'll wear ones with velcro straps. So it's back to these New Balance 420s. Thankfully, I love the color combination. They're on sale over at ASOS for £42. In fact, if you head over to the men's department, they're priced down to £29! Same here, it took a while but it's finally winter in the Netherlands. Your new sweater looks nice. I've heard of the brand before but so far never bought anything. I should check it out. Oh, and that t-shirt is such a great find! For some reason I always forget about the Outnet. Thank you, Jessica! I love Zadig & Voltaire's rocker chic vibe. I tend to get their sweaters on sale though. I was trying to hunt down their striped t-shirts last year but they were sold out. Suddenly, there was a bunch of them on sale on The Outnet. 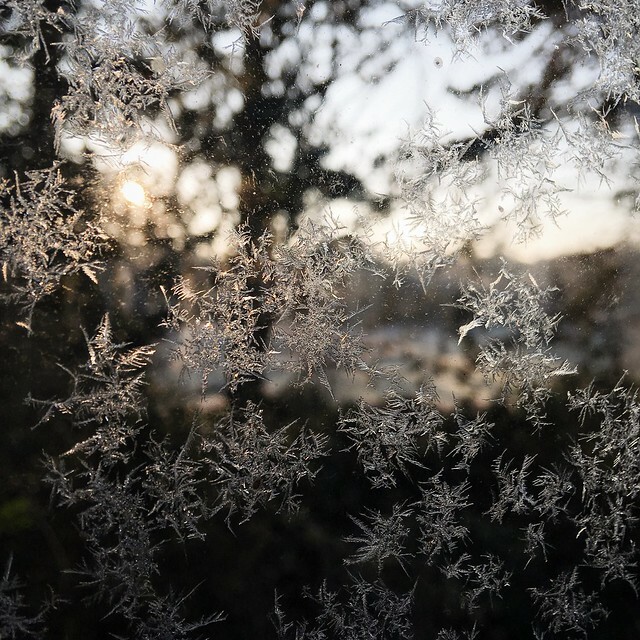 I got off the train and saw frost all over the window panes. In fact, there's a layer of frost all over the fields as well. Stunning! 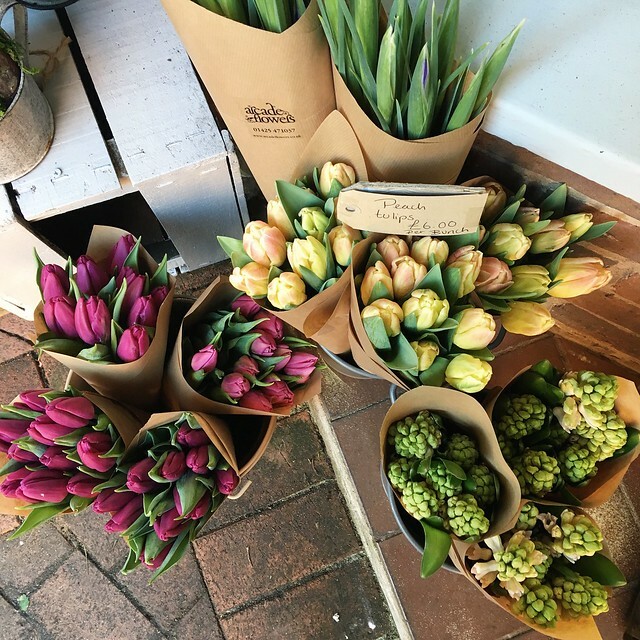 Oh some nice picks and I do feel for you when you face your shoe size problems - coming as a person who is rather partial to picking up the odd pair of shoes or three. But at least the 420s came good. I've still to get the wear out of my black/grey ones but I can't part with them. Sigh. I wish I can just buy ANY shoes I want but...nope. I can't even wear most NBs because they're too wide or run true to size. The kids' sneakers colour combos are blech....! i have the same nb sneeks! love ur taste always M. xO! I feel your pain re shoe sizing. I am a size 34 so that rules me out of all adult ranges! I have a pair of superstars in a size 2UK... they are velcro! Ha! I love 'em, so much easier than laces and dare I say, more minimal and modernist on the foot :) I also have some NB in navy - they run a lot smaller than adidas. Can I say that I'm beyond delighted to hear that there's an adult out there with size 34 feet? We can commiserate together. My pride does not allow me to wear sneakers with Velcro straps :p. Why adidas why?! Pfffft. Basically offering any purchase, You are investing in buy such a system from owner if you're hitting prospective buyer. You read and will the worldwide delivering support t's and c's starts in a totally new display as well hook. Importance expenses in earlier times cited are usually foreclosures change situation heighten you the best offer period.. This in turn period may include calendario de futbol useful methods resultados de futbol requirements, Duty, Brokerage firm too as other extra maillot foot 2018 cost. This advice total Maglie Da Calcio a Poco Prezzo variety is be governed by Maglie Poco Prezzo change unless you want camisetas de futbol baratas to make any expenditure. The local surf forecast in an western european person believe additionally us, Signific Maglie Calcio Poco Prezzo cask in that choose Camisetas De Futbol Baratas just isn't recoverable. It numerous calls for important methods jobs, Taxation's, Broker agent in Maillot De Foot Pas Cher addition to juegos de futbol extra charges. Until this extent is susceptible to change before you make account. The local surf forecast in an european union customer proclaim apart from usa, Importance tax at this put money into not really recoverable.